Amy Winehouse has been found dead at her london apartment. She was only 27. Its not up to an hour since the news broke and I discovered that some of her relatives are on my BB contacts list and are already forwarding broadcast messages to me. Trust BB users na, dem wan kill my battery with broadcast! In an interview in 2008, her mom said she would be unsurprised if her daughter died before her time. She said "Ive already come to terms with her dead. I've steeled myself to ask her what time she wants to be buried in, what cemetry. Because drugs will get her if she stays on this road"
wow! her mum said that? *sigh* They clearly were not getting along when she said this, i hope they finally did. This life ehn! There's only so much one can do for another human being. If someone is tired of life, you cannot force them to stay. From press reports, her dad has been her rock. I feel for him at this moment. When you get on a certain road, one day you will reach your destination. I really feel sorry for her mum. It must have been heart-rending still. Her parents will be sad. You can't really prepare yourself enough to hear this kind of news. I guess her mum said that out of frustration. A parent brings a child into the world, does their best but they can't live their child's life for them. She probably detached somewhat emotionally several years ago. It was just her way of coping with it all. Amy's death would still hit her hard. I'm not really a fan but it's a waste of life and talent. So sad. 'Hope she is resting in peace now. OMG!She's dead?? She didn't really help her self with all the drinks and drugs she was on.All the same may her soul rest in peace. this is sad but i can honestly say she kindda lived long considering the seriousness of her problem. this is why i wish all these mexican, colombian and italian drug lords pedaling drugs into the society would just drop dead. lol @ her relatives! I know right! I have some on my bbm as well. Her relatives are plenty especially in Naija. It is so sad her mum gave up on her.. you can't help someone who is no willing to be helped. 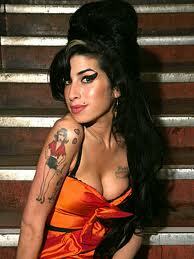 rest in peace Amy,I like you. What a sad news! She started in the church choir, u know? As a kid, she was in the choir and then fame that she cldn't handle gave her life a downward slope.. I doubt she'd rest in peace o.. sincerely. "Rehab" .... "They tried to take me back to rehab and I said no no no..." is kinda ironic...she should have gone back to rehab...poor girl. May God comfort her family and friends. I hadn't paid much attention to her or her music but I was quite bummed out that she died. Sad. I'll watch the videos you posted and celebrate with you. wow even her mum felt that way about her.may her soul rest in peace. To be sincere, i wasn't the least bit surprised when i heard she had died. My friend said "Dooshima, have u heard that Amy Winehouse is dead?" and i was like "eh-ehhn". The poor girl thought i was crazy. I'm not making light of her life or death but with the addiction, i had a dark feeling she wouldn't be among the lucky few to survive. My last post is about addictions and it features Russell Brand's tribute to her, please check it out. If only they'll listen.Crack is wack,it's been hammered and drummed! If only they'll listen.It's been hammered,drummed,sounded severally "Crack is wack",but they just won't listen.It's a very sad loss!